Ive often been frustrated by my lack of understanding of the simplest electronic device that any of us possess: the ubiquitous wall wart plug-in power supply. I must confess that when I have co-authored technical articles in the past, the emphasis is very much on the co. In such projects, I generally perform as scribe, editor, graphic artist and all-around cheerleader, while relying on my partner to supply the essential technical expertise and applied creativity. Thus, when faced with a continuing need for small external power supplies of specific voltage or RF cleanliness, I have been at the mercy of the rather insanely high prices charged for such things at Radio Shack or other electronic parts outlets; all the while, I was accumulating a whole drawer full of spare wall warts, orphaned from various long-forgotten consumer and hobby devices. In case you arent familiar with the slang term wall wart, that refers to the seemingly solid block brick that plugs into the AC mains electrical wall outlet and provides DC power to various consumer devices from cell phones through medium-sized radios to many computer peripherals. 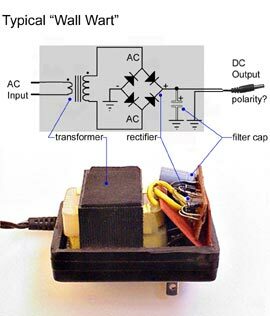 Typically, a good consumer-grade wall wart contains a transformer to reduce normal mains voltage to the range needed by the device to be powered. Once the mains AC power is lowered in voltage, it is run through a solid-state bridge (four diodes) or full-wave (two diodes) rectifier to be converted to DC. This is usually followed by a single filter capacitor. The power is then piped out through twin wires of appropriate size to carry the current at the designed power level. It is my understanding that some very inexpensive wall warts do not contain even rudimentary filter capacitors. Avoid these, if possible. Being rather desperate for some small power supplies about a year ago, I finally worked up the courage to admit my ignorance about such things to long-time friend Bill Bowers. I asked him to develop some notes for me, so that I could create both adjustable and fixed voltage DC power supplies from my drawer of wall warts. This was about like asking a NASCAR driver to give you tips on parallel parking, but Bill kindly complied. In the last few months, Ive loaned copies of these notes to several hobbyist friends, some of whom are technically astute and others, dummies like me. Both sets of folks have found Bills notes very useful, so I am encouraged to share them more widely. What follows are Bills notes, data and circuit diagrams (redrawn by me) along with my running commentary. or at least knock your heart out of rhythm. I hate it when that happens. BE CAREFUL! A second bad outcome is the possibility of frying the device that you are hoping to power with your newly modified wall wart. DC current has a positive and a negative leg and it is very easy to get them reversed (reversed polarity.) Often, this will literally fry the device that you hope to power. I take a very direct approach to checking for proper polarity at the end of one of these wall wart projects: I keep an unmodified wall wart around and I check its polarity first, using a small cheap analog volt meter. I pay close attention to which meter probe, red or black, that I use on the inner and outer parts of the DC connector and I note which direction the meter pointer swings. I then repeat the same test on my newly modified wall wart. That approach may seem both simple-minded and paranoid, but Ive made too many sad mistakes to do otherwise. BE CAREFUL! The third possible outcome of one of these simple projects is VERY GOOD: you create a voltage-regulated, RF-clean, fixed or adjustable voltage DC power supply for about $5.00 worth of parts and less than an hour of easy work. BE JOYOUS! Most wall warts are manufactured to power a single small solid-state electronic device and are usually designed to supply DC power. This article focuses entirely on wall warts that supply DC. Unless the wall wart happens to be one of those few that also provides voltage regulation, the DC voltage measured at the DC tip of the device can be between 15 and 20 VDC, when there is no load on the wall wart. As load is applied to the circuit, the voltage drops proportionally. Thus, if a wall wart is rated at 12 VDC and 500 ma., the voltage will be significantly above 12 VDC when the supply is powering a device that only uses 200 or 300 milliamps of current. Similarly, the voltage will drop well below the specified 12 volts if more than 500 milliamps of current is needed by the device to be powered. Ripple is a less than smooth, steady value for the voltage and or current produced when plotted over time. 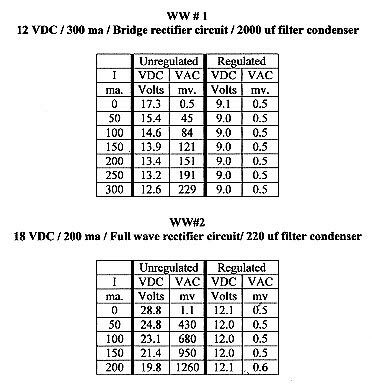 It may be thought of and measured as vestigial AC current downstream from the rectifier and is often a cause of serious noise in RF-related circuits. Unless you are interested in DXing your new power supply and QSLing yourself, adding filter capacitors to your Wall Wart project is very worthwhile. So, since we usually want to power an auxiliary device at a steady specified voltage and since we usually need a very clean power supply, what I wanted Bills help on was in creating a filtered, regulated power DC supply. We accomplished this by adding a module between the wall wart and its DC output plug that contained a fixed or adjustable voltage regulator and a network of filter capacitors. Most electronic devices have some kind of filtering, usually accomplished with multiple capacitors, to remove 60 and 120 cycle ripples from the DC electrical current powering them. Most wall warts do contain filtering, but it is usually far less than adequate for our purposes, either because the device that the wall wart was designed to power did not require filtered power or because the majority of the filtering for the original device was done inside the device itself. In these kinds of circuits, it is good practice to place filters capacitors both before and after the regulator. Bill suggests using 470µf electrolytic caps that are rated at 50 volts for this application. These are commonly used in computers and many other low voltage circuits and are often almost free when bought in bulk. In Bills two suggested circuits, these are twinned (paralleled) with .1µ caps and, in critical RF circuits, they are followed by a .001µ cap, as well. 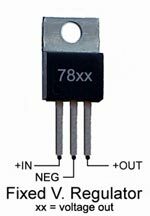 If possible, Bill also recommends placing a small (.1µ or .01µ) capacitor between the positive bus and ground, just inside the box of the device to be powered. This will ground any stray RF that might be picked up by the DC lead running from the regulator circuit to the circuit to be powered. When I was building the first of my circuits, I found that the only small 50 volt electrolytics in my junk box were 100 µf units, far smaller than the suggested 470 µf caps. I talked to Bill and he felt that the 100µf units would likely suffice. They did, in that particular application. However, I now routinely use the suggested 470µf caps for general applications. As I understand it, there is almost no such thing as too much filtering. For R2, I prefer to use a small screw-adjustable trimmer resistor by Bournes. This particular design is screw-adjustable from the top and, as with all Bournes pots, is veerrry smooth. 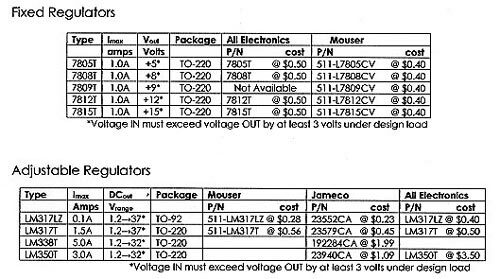 From Mouser, the part number is 652-3296Y-1-502 and the price in December 2004 was $2.00. Some hobbyists may feel that the filtering network suggested in both of the above circuits is a bit excessive. For some applications, that is undoubtedly true. However, given the critical nature of some of our circuits and the disastrous affects that 60/120 cycle buzz can have on weak signal DXing, I tend to err on the conservative side. After all, the component costs of this design are literally pennies apiece, so more filtering is generally better. Using wall warts as a basis for power supplies should, for all sorts of reasons including fire safety, be limited to supplying devices that need no more than .100 to .150 amperes of current at the specified voltage. If your device requires more current than that, we strongly recommend either buying or building a complete regulated power supply. Thanks to modern components, these are relatively simple devices, with designs, components and complete supplies being readily available. Within the range of regulated supplies requiring 100 to 150 milliamperes or less, the primary concern in selecting a wall wart is to make sure that it will supply power at least 3 volts DC in excess of the desired final controlled voltage, when the circuit is running at the designed load. 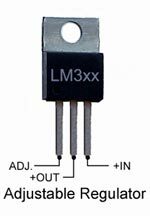 This "3 volts in excess" comes from the basic needs of the voltage regulator itself. The most straight-forward approach to selecting a wall wart for your project would be to select one with an amperage rating that matches your needs and a voltage rating that is 3 or 4 volts higher. Thus, if you need a 5 VDC, 100 ma. regulated supply, you might select a used "9 VDC" wall wart rated at 100 or 150 ma. If you need a 9 volt regulated supply at 70 ma., you might select a small "12 VDC" wall wart rated at 100 ma. The selection becomes a bit more complex, if you desire a 12 volt regulated supply. One way to go is, as discussed above, to use a 14, 15 or 16 VDC wall wart rated at least as large as your design load in milliamperes. However, these wall warts though less common are readily available from JAMECO and other supply houses for from 3 to 8 dollars. The other design strategy for building a small, filtered and regulated 12 VDC supply is to take advantage of the unregulated nature of wall warts. Remember that a wall wart rated at 12 VDC and 300 ma. will actually supply significantly more than 12 VDC at loads smaller than its rated load in milliamperes. So, if you need a regulated 12 VDC at 150 ma., a wall wart that is rated 12 VDC at 300 ma. would likely supply at least the requisite 15 volts to your new regulator at the 150 ma. load level. The only way to be sure is to measure the voltage output under the load you expect to use. Some published diagrams of wall warts show a fuse in the circuit. None of the units that we cut open had fuses. If your application requires a fuse, you'd better incorporate it in the same box with the regulator and capacitors. It was also noted in all the wall warts that were opened they all did contain a filter capacitor but it varied from 50 to 1000 uf, with most containing a 100 uf capacitor. Unless you plan to cut open your wall wart, then adding the suggested capacitors looks like a good idea. Like most devices dealing with power, voltage regulation tends to create heat. In our case, the more reduction in voltage accomplished by our regulator and the higher the current, the warmer the regulator gets. At loads around 100 ma. and dropping the voltage only 3 volts, the heat generated is only .3 watts. However, the amount of heat generated builds up rather quickly as one moves to higher currents or deeper voltage drops. Happily, all general electronics houses stock small heat sinks designed specifically to snap on the body of our "TO-220" shaped regulator. Since they only cost between $0.15 and $0.30 USD each, we strongly suggest snapping one of these devices on the regulator, no matter what the projected current draw. Further, knowing that heat generation/dissipation is a concern with power supplies, common sense would dictate normally using a metal box and making sure to provide cross-ventilation by drilling a few holes in the case. John, being a "hands-on" type, does not put his regulation/filtering modules into a case until after he hooks the entire circuit up to the device needing power and lets it run for a while. If the regulator and its little heat sink get warm, it is relatively easy to use common sense to determine what kind of enclosure and ventilation strategy, if any, is needed. This kind of careful in-use testing of your newly modified wall warts is strongly recommended. Bill ran a series of measurements on two wall warts to demonstrate the effects of the new regulation/filtering module. Both sets of measurements used a variable voltage module that I assembled from Bills second schematic. That particular module is also the one used in the photo illustrations at the end of this article. Two wall warts were tested. Each wall wart was tested from 0 ma. to its rated current capacity. The output voltage, VDC, and ripple voltage, VAC, were measured with a Fluke-45 Dual Display Voltmeter. 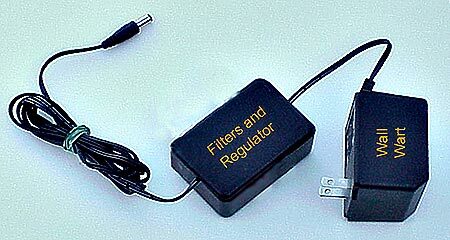 The Regulated values were obtained using the new filter/ regulator circuit. In WW#2 is probable more typical (and scary!) As you can see, the new filter circuit only allows one-half of one-thousandth of a volt of AC ripple to pass through our circuit. Finest kind! Recently, Ive used Bills first circuit to make up several fixed voltage supplies for various uses. However, as a normal procedure, I plan to prefabricate generic adjustable units rather than fixed voltage, single-use units. My approach is to order parts for five of the adjustable modules at once and build them all, as a group, on small pieces of 1 x 2 perf board. Then, when I need one, Ill drop it in the box, attach the wall wart and set the voltage with a digital multimeter. Fifteen minutes work and Ill ready to roll. If you have managed to read this far, you have almost certainly realized that these two circuits have uses far beyond harnessing the power of wall warts. For most of my own career as a MW and SWBC DXer, Ive DXed almost as much from a vehicle (12 volt DXing) as I have from a formal radio shack. These circuits are just the thing, of course, to convert the power from one or two deep-cycle batteries to the various lower voltages required by some pieces of peripheral DXing equipment.